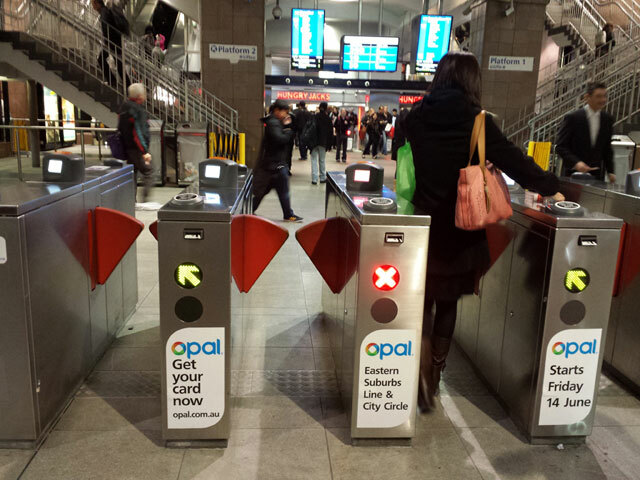 On 14th June 2013 the NSW public transport Opal smartcard electronic ticketing trial was expanded to include Sydney City Circle trains and the Eastern Suburbs trainline. This is in addition to a small number of Ferry routes which have been Opal enabled for over 6 months. Transport for NSW has chosen to rollout progressively so they can conduct thorough testing to fix any issues. 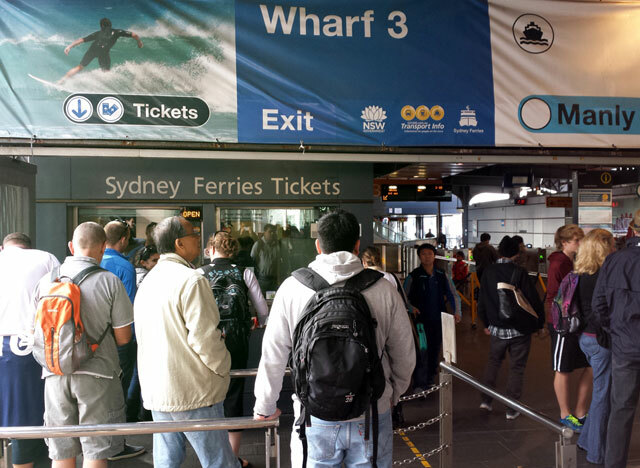 Residents of Sydney were initially promised a public transport smartcard in the late 90’s. This was due to be implemented by the time of the 2000 Olympics but never came to fruition. In 2003 the NSW government announced a new electronic public transport ticketing system would be built but that was entangled in a long running legal dispute which was settled in early 2012. The current Opal project is the result of a contract awarded by the NSW government in May 2010 to a consortium of Cubic Transportation Systems, Commonwealth Bank, epay, Parkeon and Downer EDi. The contactless Opal smartcard is NXP’s MIFARE DESFire EV1. Consortium lead Cubic Corporation will use their experience as systems integrator in the London Oyster transport smartcard project. Cubic say that the Opal system “will be ‘future-proofed’ with readers capable of accepting emerging technologies for fare payment using contactless bank cards and mobile phones”. Current NSW Transport Minister Gladys Berejiklian told ABC Radio in late 2011 that the Opal card project would cost more than $1 billion. 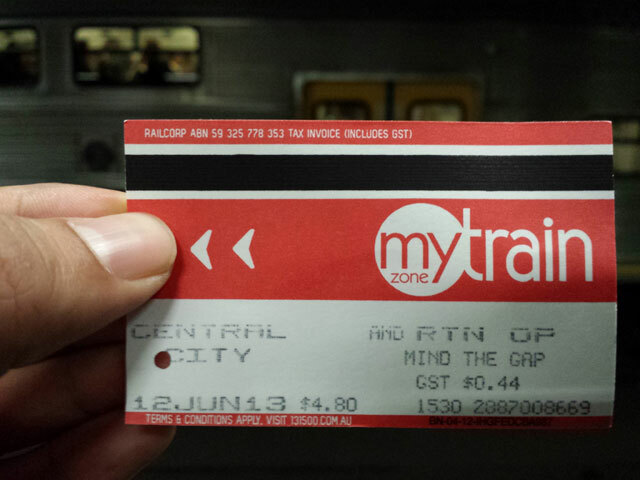 It had been hoped that the expanded Opal trial would be zonal in nature like the paper MyMulti tickets so that users who need to catch different modes of Sydney public transport could do so without penalty. Unfortunately the NSW Government’s Opal Trial pricing has controversially opted to keep the paper ticket anachronism where changing modes of public transport in a single journey results in a much higher cost. If this remains unchanged as the system expands its coverage, a public transport user who catches a bus for one hour will be charged less than another person who rides a train for half an hour and then catches a bus for half an hour. Frequent public transport users will no longer be able to prepay for long term tickets such as yearly, quarterly and monthly. However after 8 Opal trial journeys all further journeys will be free for that week and there will be a $15/day maximum cost from Monday to Saturday. In an effort to reduce congestion, users are encouraged to travel off-peak with a 30% train discount if they tap on outside of 7am-9am & 4pm-630pm on weekdays and all weekend. Opal use on Sundays will incur a flat fee of $2.50 which allows unlimited travel. Giles says and he has found tapping on/off to be faster than Melbourne’s Myki system. He also says the system backend is faster between tapping on/off and having it appear online as a transaction usually within 15-20 minutes – a big improvement from the 24 hours Myki quotes. As a frequent public transport user he likes the ability to link multiple Opal cards to the one login account. This makes it easy to have work and personal cards – just print off the work opal card statement for reimbursement from your employer etc. I also tested Opal during mid June. 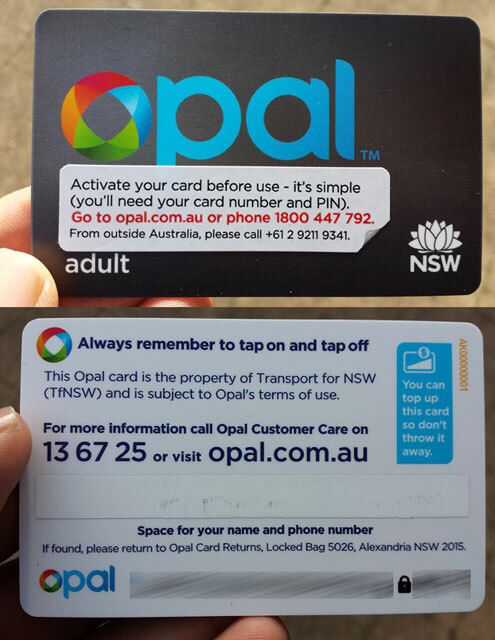 Opal cards can be mail ordered online, by phone or at a Transport for NSW shopfront. Retailers will sell them by late 2013. According to Transport for NSW over 75% of Opal card trial users have opted for the auto-reload function when the card’s stored value falls below $10. Trip details are available online on the Opal website and they can be exported but unfortunately only as a PDF, there isn’t an option for CSV export. 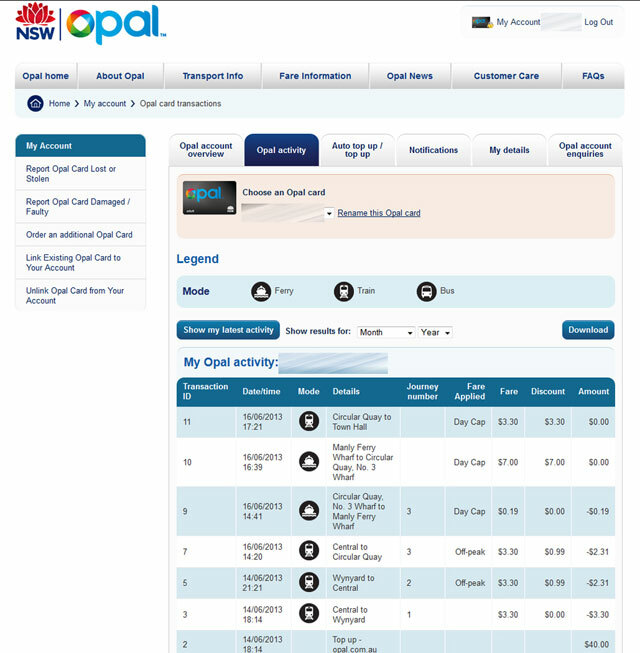 After catching a train from Central to Wynyard during the Friday peak halfway through the ride the ‘Opal activity’ webpage displayed the transaction “Central to unfinished journey No tap off – Default fare $8.10”. This continued to display for 10 minutes after we had tapped off at Wynyard station so we thought the Wynyard card reader had failed. Moments before we called the Opal phone number to make a complaint the trip refreshed to say “Central to Wynyard – $3.30”. This lag between transaction time and appearance in the Opal system online may cause new users to be worried that they have accidentally been charged the wrong fare. OPAL trial users should check the website 10-20 minutes after they tap off to make sure they haven’t been charged maximum fare because of a faulty reader. Transportation Analyst David Caldwell feels that to date the Opal project seems to suffer to a degree from a “cargo cult” mentality. He told me that it looks like Opal desires to replicate the superficial form of successful international systems, without addressing the underlying mechanics, the pricing structures for users and revenue distribution for operators. “the fundamental problem with trip-based charging is that you penalise users who interrupt their journeys, say to drop the kids at school or do shopping. It detracts from the value proposition of transit for no good reason”. “ultimately that is the end game who pays how much for what. As yet there is no clarity on this end functional outcome, a little concerning for a project with a bit over $1 billion committed spend. The question is how does Opal help transit and transit users – does it more equitably link fares to costs, does it make journeys faster and more comfortable, does it encourage transit use in a practical way? The objectives that would normally underpin a project like this, like enabling seamless intermodal transfers, are absent”. “to mitigate against this there is a $15/day cap, but this is really a kludge. A flat cap does not equitably address cost inequities in multi-modal and broken-journeys. Even with the $15 cap and pay for four-days and the fifth is free, the prices end up being significantly higher than current multi-modal “MyZone”, and also higher than say commuter tickets in London, where there is generally more than double the level of service”. “the idea of capping bus trips in South Eastern Sydney at the same price as say train journeys to Lithgow would clearly be highly inequitable and unrepresentative of cost, so this $15 will need some geographic limit in addition to time. This is just one of several key areas in which the goal is not clear. The next stage of roll-out hopefully will be very different to the trial approach. London’s Oyster card, to which Sydney’s Opal is often compared, defines and caps fares based on geographic zone usage, and so far the government has only committed to eliminate Sydney’s zone system, without explaining how multi-modal fares might be equitably determined otherwise”. Summing up Caldwell told me that “the current Opal trial pricing structure is not commensurate with either usage or value to the user. This is the real challenge, and it has been solved by cities like Hamburg, Zurich, Perth and London by applying geographic zone and time-based fares, rather than trying to figure out how to define individual journeys with breakages and mode changes in the mix”. Opal was an opportunity to completely reboot how Sydney-siders use public transport. Many imaginative approaches could have been used to improve fairness, increase utilization of unused bus/train/ferry capacity and shift usage from overburdened routes. Disappointingly so far the Opal trial indicates that the state government has chosen instead to keep many of the anachronisms of the paper ticketing system and instead splash on a billion dollar plus coat of paint to make it seem like something big has been achieved. The only glimmer of hope is a big change in pricing and user incentives as trial feedback is received and the trial area expands over time.